Making the same roast turkey year after year can get a little boring. And while I’ve mixed it up in the past by barbecuing, smoking, spatchcocking, deconstructing, and even deep-frying my birds, there comes a time when you just want to knock tradition out the window and come up with a whole new meal. This year is that year. Turkey has a natural affinity with flavorful chiles, their darkly rich essence permeating the otherwise bland meat. Make sure to purchase pure chile powder, rather than chili powder which is a mixture of spices, seasonings, and salt. I chose ancho chile powder because I like the subtle spiciness, and sweet-smoky flavor. But you can also try chipotle or another pure chile. Just avoid anything overly spicy or your guests might not be too happy with you. 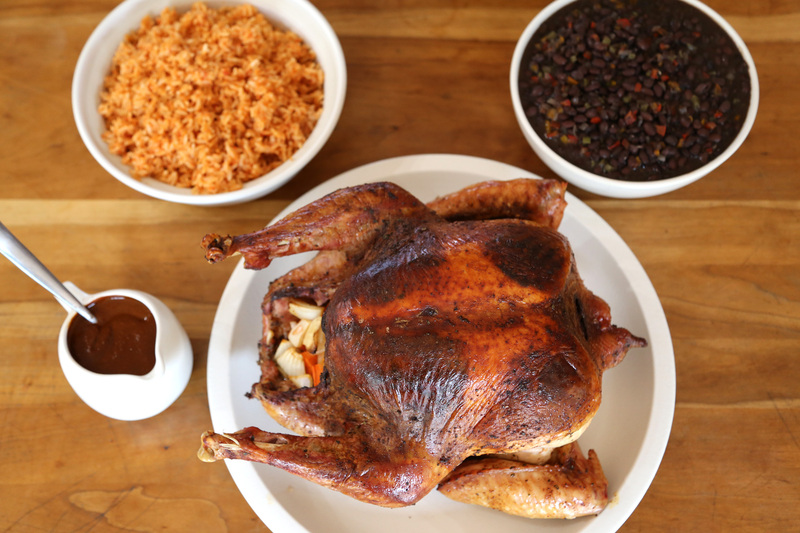 I like to pair this turkey with BAB's recipe for mole “gravy.” The mole takes a bit of time, but it makes a lot and is well worth it, plus you can make it in advance. 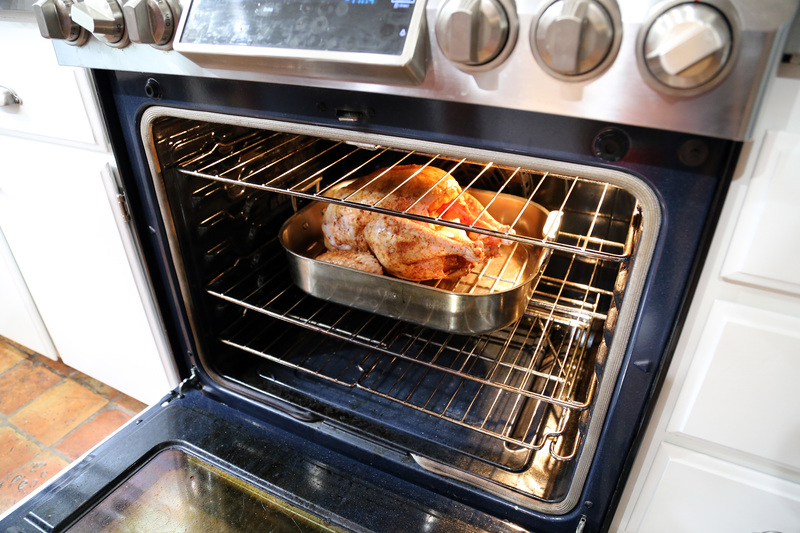 One to two days before roasting: Dry the turkey with paper towels and place it in a roasting pan or a baking pan. In a bowl, mix together the salt, chile powder, and oregano. 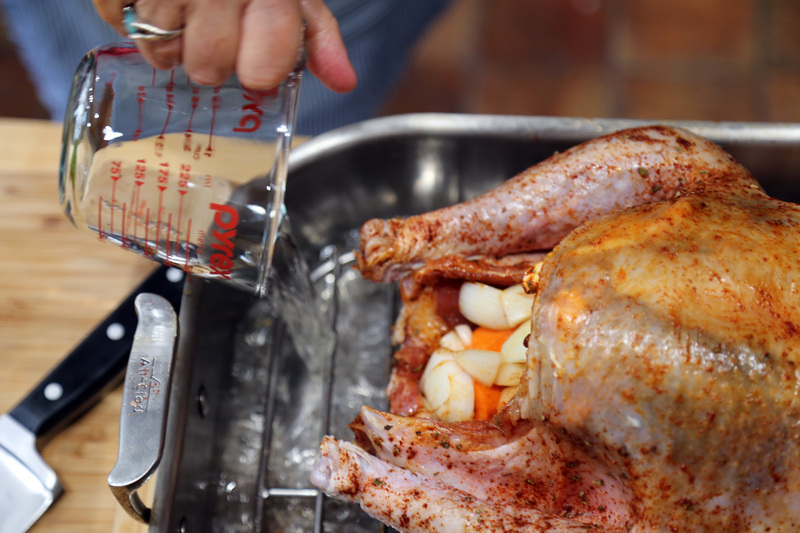 Rub the salt mixture all over the turkey, under and over the skin and in the cavities. Cover tightly with plastic wrap and refrigerate until ready to cook. 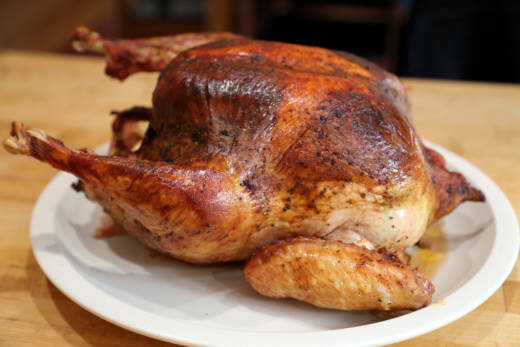 The day you plan to serve the turkey: Remove the turkey from the refrigerator about 1 hour before roasting. Meanwhile, preheat the oven to 400F. 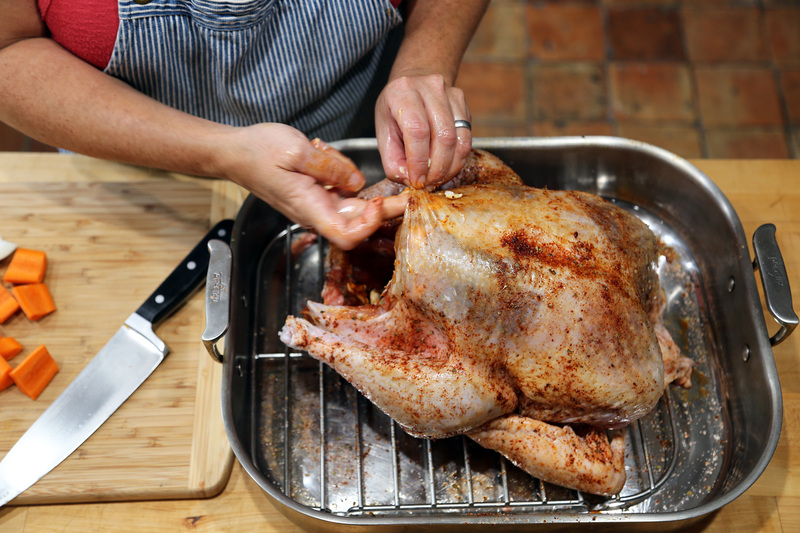 Remove the plastic wrap, and if the turkey seems excessively moist, pat it dry with paper towels. Shove some butter under the skin and in the cavity. Stuff the cavity with the onion and carrot. Set the turkey on a roasting rack set inside of a roasting pan just big enough to hold the turkey. Add the stock or wine to the pan. Roast the turkey for 1 hour, then reduce the heat to 375F. Turn the bird upside down to brown the bottom. Continue to roast, basting the turkey occasionally with the pan juices, for 1 more hour. Remove the turkey from the oven and carefully turn the bird breast side up. Continue to roast until the temperature reads 165F in the thickest part of the breast away from the bone or 170F in the thickest part of the thigh away from the bone. The turkey juices should run clear. 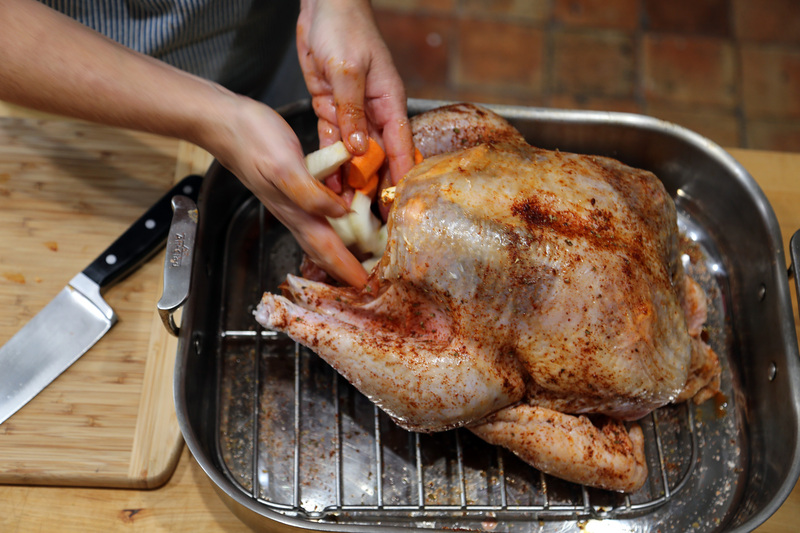 If the turkey starts to darken too quickly, lay a piece of aluminum foil over the top. 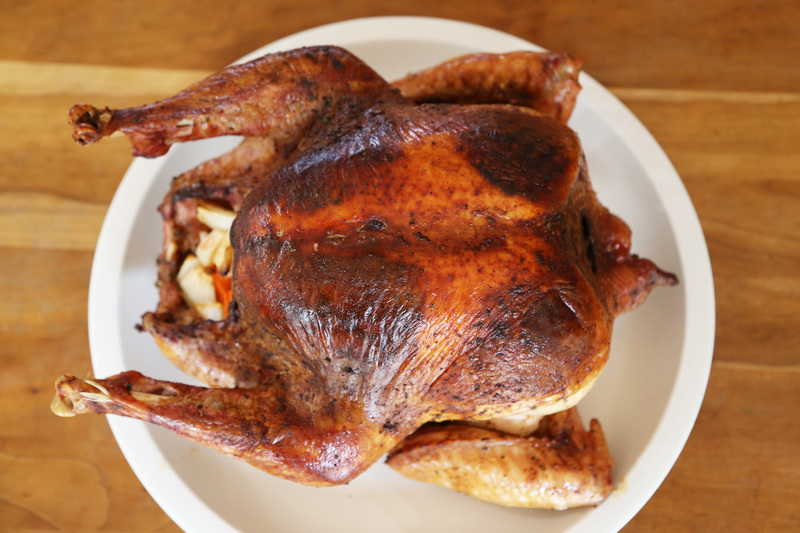 Remove the turkey from the oven, transfer to a carving board, loosely tent with foil, and let rest for 15 minutes. Carve and serve with the mole gravy alongside. NOTE: Be sure to reserve the turkey carcass and roasted vegetables for making stock.